Modern societies are dependent on information technologies, IT-based systems and services to provide efficieny. On the other hand, these technologies create new deficits in safety and can increase risks of failures, emergencies and crashes. This volume addresses key related issues. 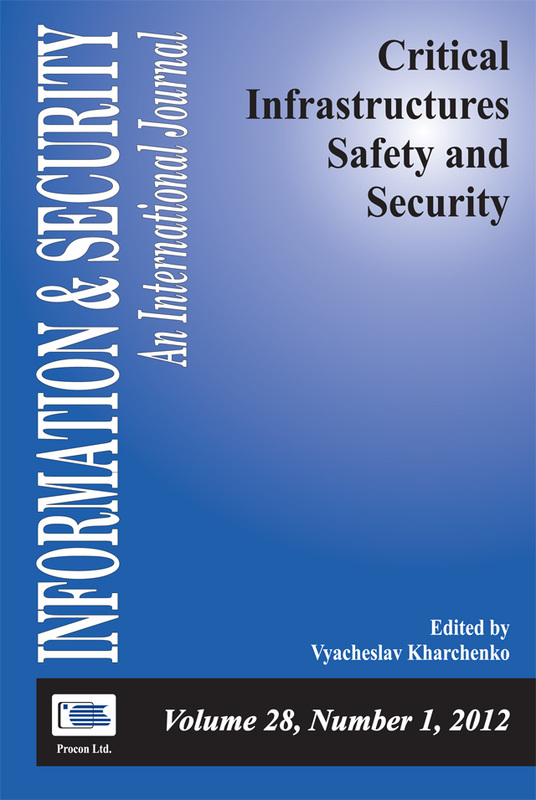 It includes primarily papers, presented at the Workshop on Critical Infrastructure Safety and Security (CrISS-DESSERT), that took place in Kirovograd, Ukraine, 11-13 May 2011. Kharchenko, Vyacheslav. "Editorial: Critical Infrastructures Safety and Security. Trends in the Context of Information Technology Development." Information & Security: An International Journal 28, no. 1 (2012): 5-10. Procházková, Dana. "Principles of Mitigating and Managing Human System Risks." Information & Security: An International Journal 28, no. 1 (2012): 21-36. Ivanchenko, Oleg, Vyacheslav Kharchenko, and Aleksandr Skatkov. "Management of Critical Infrastructures Based on Technical Megastate." Information & Security: An International Journal 28, no. 1 (2012): 37-51. Kharchenko, Vyacheslav, and Eugene Brezhnev. "Formalizing Power Grid Influence to Assess the Safety of Nuclear Power Plants." Information & Security: An International Journal 28, no. 1 (2012): 65-78. Androulidakis, Iosif. "PRETTY (Private Telephony Security) - Securing the Private Telephony Infrastructure." Information & Security: An International Journal 28, no. 1 (2012): 89-97. Sklyar, Vladimir. "Cyber Security of Safety-Critical Infrastructures: A Case Study for Nuclear Facilities." Information & Security: An International Journal 28, no. 1 (2012): 98-107. Potij, Alexandr, Dmitrij Komin, and Inna Rebriy. "A Method of Evaluating Assurance Requirements." Information & Security: An International Journal 28, no. 1 (2012): 108-120. Lysenko, Sergiy, and Oleg Savenko. "Software for Computer Systems Trojans Detection as a Safety-Case Tool." 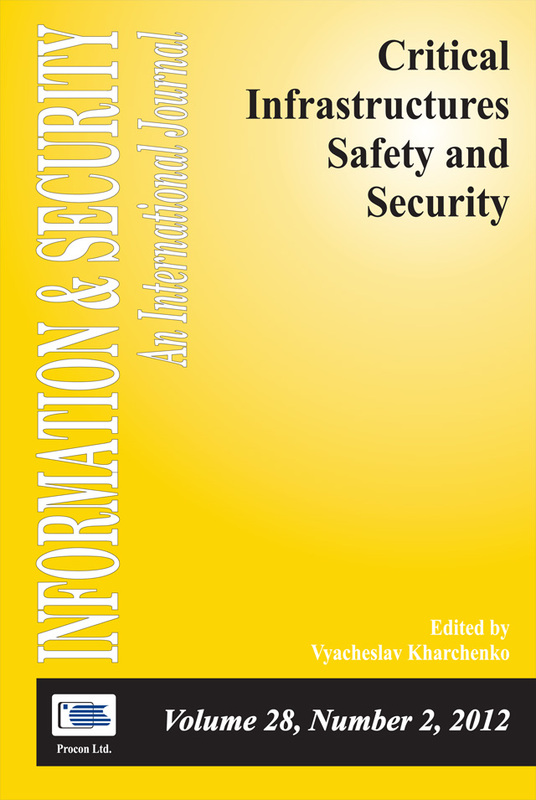 Information & Security: An International Journal 28, no. 1 (2012): 121-132. Strjuk, Aleksey, Oleg Odarushchenko, and Valentina Odarushchenko. "Band Width Maximin Fair Optimization in Mesh Networks Based on Perceived Quality of Service." Information & Security: An International Journal 28, no. 1 (2012): 133-145. Volkoviy, Andriy, and Ilya Tikhov. "Use of Mobile Applications in Security and Safety Systems." Information & Security: An International Journal 28, no. 1 (2012): 146-153. Gorbenko, Anatoliy, Vyacheslav Kharchenko, Olga Tarasyuk, and Alexander Romanovsky. "Intrusion-Avoidance via System Diversity." Information & Security: An International Journal 28, no. 1 (2012): 154-158. Procházková, Dana. "Overview of Fine Exact Methods of Safety Engineering." Information & Security: An International Journal 28, no. 2 (2012): 167-178. Gorbenko, Anatoliy, Vyacheslav Kharchenko, Olga Tarasyuk, and Sergiy Zasukha. "A Study of Orbital Carrier Rocket and Spacecraft Failures: 2000-2009." Information & Security: An International Journal 28, no. 2 (2012): 179-198. Brezhnev, Eugene. "An Approach for Assessing Risk of Common Cause Failures in Critical Infrastructures." Information & Security: An International Journal 28, no. 2 (2012): 199-210. Kharchenko, Vyacheslav, Oleg Odarushchenko, and Valentina Odarushchenko. "Multi-Fragmental Availability Models of Critical Infrastructures with Variable Parameters of System Dependability." Information & Security: An International Journal 28, no. 2 (2012): 248-265. Biryukov, Andriy, Oleksandr Gordieiev, and Oleksandr Yakimenko. "On the Necessity to Create a National Processing Centre." Information & Security: An International Journal 28, no. 2 (2012): 266-272. Illiashenko, Oleg, and Eugene Babeshko. "Choosing FMECA-Based Techniques and Tools for Safety Analysis of Critical Systems." Information & Security: An International Journal 28, no. 2 (2012): 275-285. Netkachova, Kateryna. "Model and Implementation of Safety Case Cores." Information & Security: An International Journal 28, no. 2 (2012): 286-295. Kharchenko, Vyacheslav, Artem Boyarchuk, and Chris Phillips. "TEMPUS-SAFEGUARD: National Safety IT-Engineering Network of Centres of Innovative Academia-Industry Handshaking." Information & Security: An International Journal 28, no. 2 (2012): 315-318.